Of all the work in A Grin Without a Cat, it was Silent Movie that I found the most unexpectedly engaging. There are other works here I knew well before or had seen recently and there are excerpts from longer single screen works that I found interesting but not compelling (though they have, I suppose, served their purpose by sending me back to the films). With Silent Movie there’s an odd fascination that comes form the ever-changing array of images, seemingly random in nature but constrained and ordered by the tower that houses them. Faced with five screens, particularly as a vertical stack, it’s hard to know quite where to look. It’s impossible to watch Silent Movie through and feel you’ve seen it; there would always be a different edit were one to watch again and allow one’s gaze to go with the flow again. In fact, this is a work I returned to several times, sampling it in short bursts rather than attempting to absorb the whole. The complexity of the images and their tightly stacked form made me keep wanting to go back but also kept sending me away again. Silent Movie, as the name suggests, is to an extent about early cinema; indeed the work was commissioned to mark the centenary of cinema in 1995 and incorporates some clips from silent films. The images are a complex mix of old and new – newly made but with an old feel – with the use of black and white enhancing the visual connection of the silent era. It’s not just this that works as a visual signifier of the past though; working digitally, Marker mimics both the visual effects of early cinema and its use of intertitles. On each monitor a different theme of early cinema is explored: the face, the journey, the waltz, the gesture and, on one, a collection of nearly a hundred silent era inter titles. The installation is controlled by computer so that the images, and the sequences in which they appear, are constantly changing. As is the case with what we think of as silent cinema, the work isn’t silent; there is, of course, music. Here in the form of an accompanying musical track which is independent of the images. It’s hard to pin down quite what it is about Silent Movie that I liked so much. I think in part it’s that feeling of not knowing quite where to look at any particular moment and the sense that no two experiences of the work are the same. And, of course, it’s the nagging familiarity of the images that comes from Marker’s understanding of film history and his ability to mimic its tropes. Then there’s the deliberate nod to constructivist tower structures. And perhaps, with the work coming back to mind after seeing Richard Grayson’s horizontal row of screens, there’s something about the power of five. 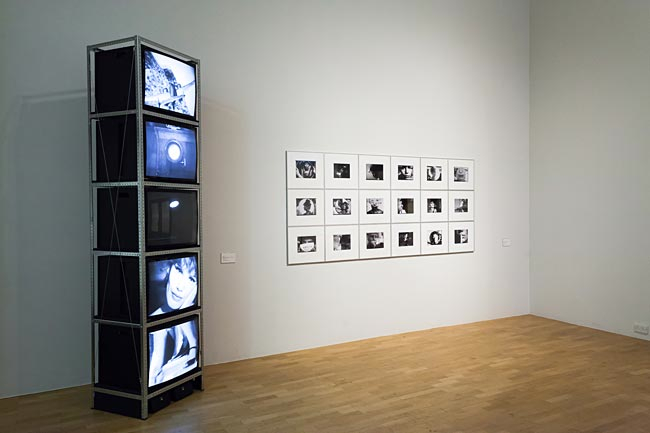 Chris Marker: A Grin Without a Cat is at the Whitechapel Gallery until 22 June 2014. My post about the exhibition on MostlyFilm.com can be found here. 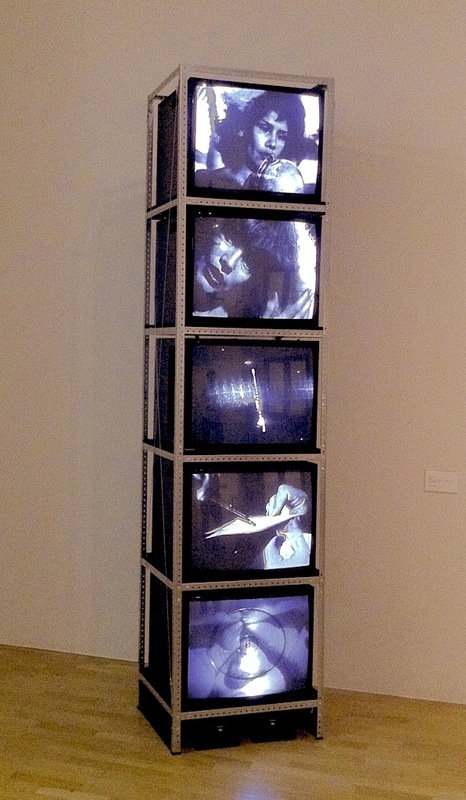 This entry was posted in Film/Video, Installation, Technology, Television and tagged A Grin Without a Cat, art, Chris Marker, cinema, film, Silent Movie, Whitechapel Gallery by Ann Jones. Bookmark the permalink.